April 18, 2008-At the Annual AACRAO Meeting in Orlando a few weeks ago, it was refreshing to see how we had grown (our network, our staff) since AACRAO 07 having developed numerous relationships with colleges throughout the nation. 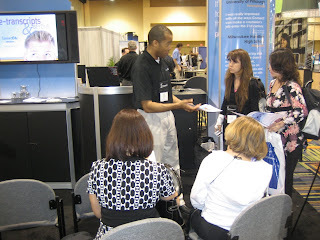 At AACRAO 07, we focused on discussing the inefficiencies of sending and receiving paper transcripts. In fact, we stacked approximately 600,000 pieces of paper in our booth last year, and color coded those documents that get lost as well as those that suffer data entry mistakes to drive home our point. The message we delivered last year was powerful...and many attendees commented as they passed our booth this year- “Where's the paper?”. 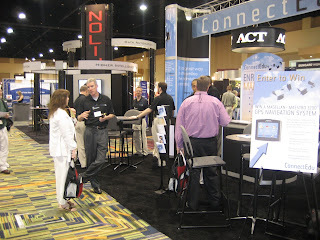 At AACRAO '08 we were again busy delivering an important efficiency message as well as highlighting the fact that the Connect! offering has expanded to include both electronic document exchange and enrollment marketing! Colleges around the country spend hundreds of thousands of dollars each year trying to develop relationships with potential students. Colleges buy names and addresses from multiple list management and testing companies and then begin the marketing onslaught. Often times these names are purchased with a limited amount of information on the student- zipcode, age, a standardized test score. From there, a college crosses its “fiscal” fingers and hopes that all the mail and emails that they send will result in a relationship. Never mind the fact that today's generation of students does not monitor an email address - it's their cell phone or social network. Good luck with that! On the flip-side, potential students have no say in this process and almost no ability to stop the direct mail onslaught. They simply take a standardized test, fill out a career interest survey at school, or enroll for FAFSA advice and the next thing they know they are flooded with direct mail. Routinely, the student has no interest in a college that blasts them, or the college may not even have the student's intended major, yet their mailbox fills up with direct marketing. The worst of it- a student and their family can't opt-out or scream “Stop” when the mailbox is full. And let's not even mention the dollars that get spent on this stuff. We're talking literally thousands of dollars per student! As we discussed with colleges at AACRAO, there indeed is a more cost-effective and targeted method to build actual relationships with students. Colleges can now build relationships with an interested student earlier in the college preparation process... yes, before the sophomore year!...And save time and money in the process. Check out how colleges are meeting the Next Generation of Students with Connect!